Picture an active woman who loved sports, spending time with family, and her job. She started at the bottom and worked her way up the ladder to become an Assistant Manager of a fast food restaurant – a job that was perfect for her. She loved serving customers, organizing the store, supervising staff, and concentrating on a million and one administrative tasks. Life was good, until it wasn’t. Early January a few years ago, she had a fainting spell on Christmas Eve and then trouble breathing. She went to the Emergency Room just to be safe, and walked out with a life-changing diagnosis of multiple myeloma and cardiac amyloidosis (also called “stiff heart syndrome). Her doctors described this as “a disease process likely to be fatal.” Symptoms include chronic fatigue, bone pain, muscle weakness, shortness of breath, nonrestorative sleep, decreased ability to focus, among many others. It was treatable, not curable. Clearly, working at a busy job that was both mentally and physically demanding was no longer an option. Our client was thankful that her employer had a long-term disability policy that provided benefits (a percentage of her salary) in cases just like this. She also applied and was approved for Social Security Disability Insurance. For five years, benefits were paid as our client received treatment. Then, due to an error, social security disability benefits were denied. This should not have had any bearing on the employer’s disability insurance, because those determinations are separate. However, in this case it looks like the employer’s insurance company, Cigna, saw the SSDI termination as a bandwagon to jump on, and they denied benefits, too. Our client was left with no income at all. The error with Social Security was fairly quickly fixed and SSDI benefits were restored. The mess with Cigna took much longer. Our client hired BenGlassLaw to submit a formal appeal. In the appeal, we pointed out that there was no evidence – none – that our client’s condition had improved. While Social Security recognized and fixed their error, disability insurance companies just don’t work that way. Once they have denied benefits, there is nothing short of a formal appeal that will convince them to change their mind. We did win this appeal, and the client is receiving benefits from Cigna again. 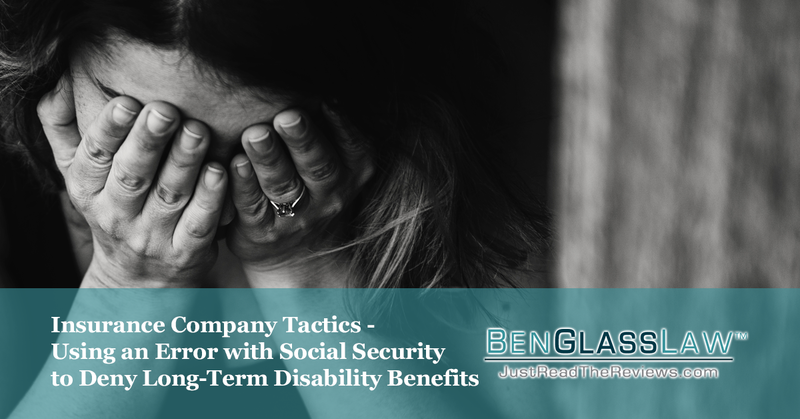 The moral of this story is that if you are receiving Social Security Disability benefits and they are denied, beware of what that can do to your long-term disability claim if you are receiving benefits through your employer’s plan. Communicate with both the insurance company and your doctors. It will be important for the insurance company to know that you are working to fix an error (if SSDI was terminated due to an error or missing paperwork). It will be important for your doctor to know this may trigger a “review” by the insurance company. Your doctor needs to respond quickly and completely to any request for information about your condition that may come from the insurance company. what your return-to-work prognosis is. If the doctor doesn’t think you’ll be able to return to work, they need to explain why. In our client’s case, is it coincidental that Cigna used the SSA termination of benefits as a trigger to end their own services? You’d like to think so. In an ideal world, these claim decisions are separate and based on the principled analysis of the medical professionals assessing the patient and her medical records. In reality, though, insurance companies will often use the termination of SSA benefits as the catalyst to cut their own benefits to a client.